All Glow, a photo by The Bacher Family on Flickr. 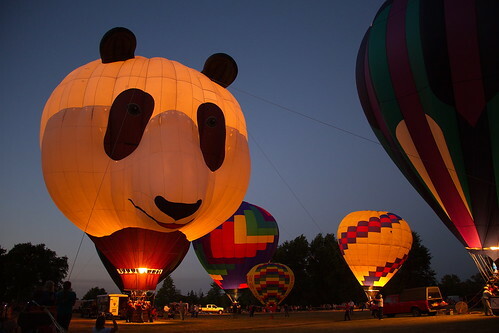 This was our second year attending the "Night Glow" at the annual Art and Air Festival in Albany, Oregon. For extra safety in windy conditions, this year's "glow" took place a little earlier in the evening than usual, which made for a less dramatic show, but easier conditions for photographs! This is what's called "All Glow," in which all of the tethered balloons light their gas burners at the same time, creating enormous glowing lamps all over the field.